A New Jersey boardwalk treat, these sandwiches are worth the mess they make. Consider assembling a line of toppings – chopped nuts, maraschino cherries, chocolate chips, toasted coconut – and letting everyone build their own sandwiches. 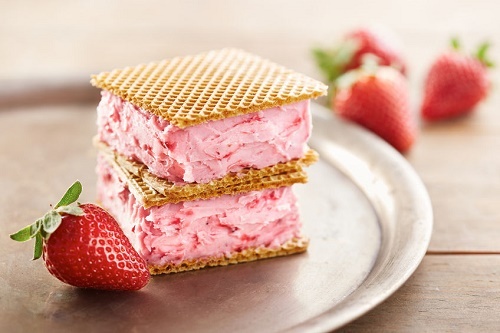 In a bowl, fold strawberries into softened ice cream. Spoon ice cream onto a warm waffle, drizzle with chocolate sauce, and top with second waffle. Make it Neapolitan by mixing equal parts strawberry, chocolate and vanilla ice creams. Replace chocolate sauce with strawberry syrup, and you’ve got a decadent ice cream sandwich that’s sure to please. What’s your favorite strawberry dessert that helps you beat the heat?